In our house, you cannot drink anything cold out of a regular water glass. This is because in our house, we have Rupert, a determined grey tabby who has made it his mission to tip over any glass of cold liquid he can find. And it’s not as if he’s just trying to drink out of the cup and it tips; no, he will sneak up, hook his paw over one edge, and deliberately tip it over, just to watch the mess . This has led me to a continual search for ‘Rupert-safe cups’ – basically any drinking vessel with a sturdy lid, in which cold liquid will be safe even if overturned. As a canner, I own a rather large collection of glass jars, in all shapes and sizes. So I was thrilled when I discovered that canning jar manufacturers have come out with screw-on lids that include a hole into which you can place a straw, essentially allowing you to repurpose canning jars into trendy ‘hipster’ glasses. Of course, glass jars are heavy, and cold liquid leads to condensation, which leads to the need for a coaster for the jar. Also, a heavy, wet, glass jar is prone to slipping when you try to grab it off the table. So back in February, in the midst of my Dishcloth-a-Day personal challenge, I noodled around with some dishcloth cotton and came up with these. I started first with the quart jar size, because that’s what I happened to be drinking out of at the time, and then made some adjustments and did the smaller pint jar size next. Over the past month or so, I’ve had a coworker test drive the smaller version for me, and had a couple friends do some quick tech edits of the pattern itself. I’ve also been using both cozies on a regular basis, making sure that they worked the way they were intended. 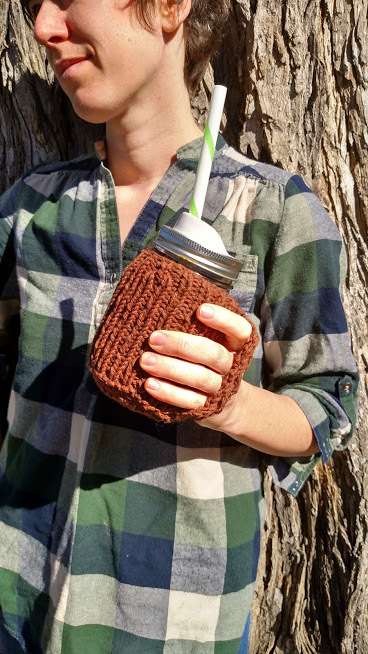 Overall, I’m pretty happy with the cozies. The ribbing allows the cozy to fit snugly around the jar, while the handle provides some much-needed stability when you’re picking it up. The cozy is knit all in one piece; so there is no seaming, and the entire thing is knit in the round. Made out of cotton, they’re easy to toss into the washer and dryer, ready to be used whenever you’re in the mood for a cold (or hot) beverage. And bonus, it means I get to have a big glass of ice cold water near me at all times, without having to worry about tracking down a coaster, and also without having to worry about chasing off a persistent grey tabby cat. 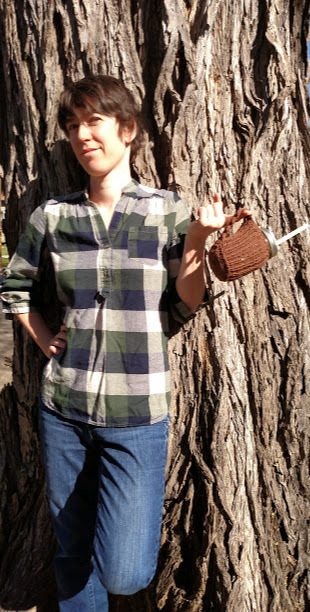 Want to make some Hipster Jar Cozies for yourself? As of today, the pattern is now available for purchase and download via Ravelry. Enjoy! The letter J is brought to you by the Blogging from A to Z Challenge.